An ISO 9001 quality management system is aimed at supporting an organisation’s aims and objectives, documenting our processes, procedures, and responsibilities for achieving quality policies and objectives. Since initial certification in 2009, JMG Systems has continually focused efforts of our business model using this quality standard framework as a reflection of how the business operations meets the requirements of our customers and stakeholders. The new updated ISO9001:2015 standard is focused on quality principles such as customer focus, leadership, people engagement, process improvement and relationships, and in August, through a magnificent team effort, the company was successful yet again. In July this year, the Omagh Food Bank charity called out for donations as stocks were dwindling due to a high demand in the local area. As a result, our social committee took action, and with the help and good will of all of our team, we were delighted to deliver a van load of donations to the charity earlier this week. 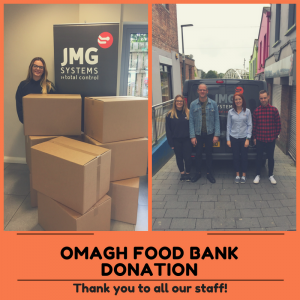 Pictured are staff from JMG dropping the donations off this morning with Timothy Shiels from the Omagh Community Church. (Anyone wishing to donate to the charity can find out details on their website at www.omaghcommunitychurch.com). 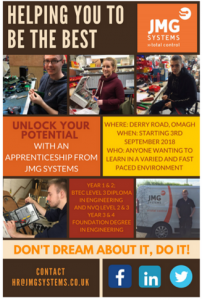 After a successful introduction last year, JMG Systems are expanding the Apprenticeship scheme again for 2018/2019 intake. We open the opportunity for every member of staff in the company, as well as external candidates, and all training and development is performed in conjunction with the local South West College, Omagh. Our team will be present at the Conexpo Con/Agg 2017 event being held in Las Vegas at the start of March. A range of new products and business improvement concepts will be on display so feel free to come along for a chat and a demonstration Stand C22705, In Central Hall C1-C2. If you would like to arrange a specific appointment to see where JMG Systems can help your business, please contact our team in advance via sales@jmgsystems.co.uk. 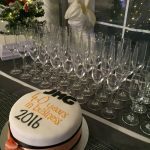 To complete our 40th year in business, JMG Systems had the pleasure of welcoming our customers, suppliers and staff at our headquarters building before Christmas. In a welcome speech by Managing Director, Joann McCaul, she acknowledged the significant contribution made by the invited guests to the success of the business, however key recognition was reserved for the owners and founders, Joe & Moya McGoldrick, for their insight and commitment to the business over the 40yrs. Thank you to all those guests who took the time out to share in the evening and help us to celebrate this major milestone.